Cristiano Ronaldo deserves his place in Real Madrid history after becoming their record La Liga scorer, manager Rafael Benitez says. 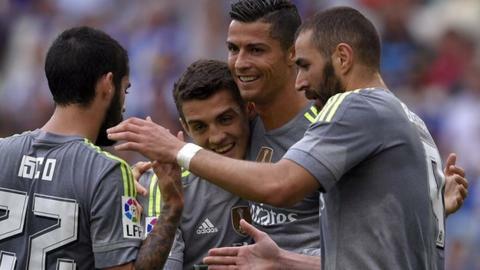 The Portugal forward's five goals in a 6-0 win at Espanyol on Saturday took him to 230 Spanish top-flight goals, passing Raul's record of 228. "The numbers speak for themselves," Benitez said of Ronaldo, who has reached his total in 204 matches. "Someone who scores so many goals has a place in the history books." Benitez added: "I hope that he can continue to add to his goalscoring account for his own benefit and that of the team." Ronaldo is the fourth highest scorer in La Liga history - with Barcelona's Lionel Messi leading the way on 287. The Real Madrid forward, though, has been the division's top scorer in each of the last two seasons, finishing the 2014-15 campaign with 48 league goals. He has averaged 1.13 goals per league game in six years at Real since his £80m transfer from Manchester United. Pepe, Real Madrid's Portugal international defender, said after the 30-year-old's latest starring performance: "Espanyol have a good team but when Cristiano has his day, it's impossible." It was the second time in 2015 that Ronaldo had scored five goals in a match - he did it when Real beat Granada 9-1 in La Liga on 5 April. However, he had been called into question after going without a goal in either of his club's opening two La Liga matches, while also failing to score during the recent international break as Portugal lost a friendly to France and beat Armenia in a Euro 2016 qualifier. But Real goalkeeper Keylor Navas said that Ronaldo - winner of the Fifa Ballon d'Or in each of the last two years - remains the world's top player. Navas said: "He's incredible. We all know full well that he's the best player in the world and we're delighted to have him on our team." Real Madrid have scored 11 unanswered goals in two league games after opening their season with a 0-0 draw at Sporting Gijon, but Benitez feels that there is still room for improvement. "We played well but there are things to be polished," Benitez said. "Espanyol has done many things right, but we have a lot of punch and we took advantage. "I said this team would be attacking. We attacked, but we try to have balance. At the front I ask you to have freedom of movement to create problems. That was the key. It was not easy and they have done very well."